Frontpage Interview’s guest today is Bill Warner, the director of the Center for the Study of Political Islam (CSPI) and spokesman for PoliticalIslam.com. FP: Bill Warner, welcome to Frontpage Interview. FP: I’d like to talk to you today about how many of the names, words and phrases we use about Islam are muddled and incorrect. Many non-Muslims create certain terms about Islam to try to make the world seem safer and to feel good about themselves. But many of these terms have no actual basis in Islamic theology or culture and have no real meaning in an Islamic context. Warner: “Moderate Muslim” is a perfect example of the muddle and incorrect terminology that kafirs (unbelievers) use. This term is intended to describe a Muslim who doesn’t seem dangerous or advocate violence. But “moderate Muslim” is a non-Muslim name, one that kafirs made up. The doctrine of Islam does talk about the different kinds of Muslims. The measure of a Muslim is the Koran and the Sunna. Anyone who follows these teachings is a moderate Muslim, by definition. Islamic doctrine defines what is moderate and not moderate. Since we are dealing with Islam, we need to know that the doctrine is dualistic. Islam can have two doctrines about any issue. This follows from the Koran. The early Koran, which was written in Mecca is generally religious. The Koran written in Medina is very political and includes jihad. The two Korans are not only very different, but they also contradict each other in major ways. So we have the possibility of two kinds of moderate Muslims, since we have two doctrines. Osama bin Laden is a moderate Muslim, who follows the Koran of Medina, the Koran of jihad. Kafirs call him an extremist or radical Muslim. Actually, Osama obeys the Koran of Medina and the Sunna of Mohammed, so he is a moderate, pious Medinan Muslim. The jihadists on September 11, 2001 were all moderate Medinan Muslims. They were not extremists or radicals. The other kind of moderate Muslim follows the Koran of Mecca and he is more generally what kafirs mean when they say “moderate Muslim”. But how moderate is a Meccan Muslim? A moderate Muslim thinks that you are a kafir, but he isn’t violent, just antagonistic. FP: So tell us exactly what “kafir” means. We take it to mean unbeliever but I presume it is more complicated than that. For over the last 1400 years, 270 million kafirs have died as a result of the political doctrine of Islam. It is the biggest single source of suffering in the history of the world. The word kafir is the worst word in the human language. It is far worse than the n-word, because the n-word is a personal opinion, whereas, kafir is Allah’s decree. Nearly two thirds of the Koran is devoted to the kafir. Islam is fixated on the kafir and the moderate Muslim thinks that you are a kafir. How moderate is that? FP: I guess not very moderate. Warner: Well the moderation does not stop there. A moderate Muslim follows Islamic ethics. Not only is the Koran a dualistic document, but also Islamic ethics are dualistic. Islam has one set of rules for Muslims and another set of rules for the kafirs. A Muslim does not lie, cheat, kill, or harm another Muslim. But, if it will advance Islam, a kafir may be cheated, deceived, murdered, tortured and raped. Or a Muslim may treat a kafir like a brother. It is the dualism of Islam that gives it such power. It has the entire good cop/bad cop psychology built into its very DNA. There have been other groups with dualistic ethics, the KKK for instance. But a member of the KKK hates all blacks all the time. There is a certain bald-faced honesty in the hatred of the KKK. But Islam has the good cop face to the world most of the time. The bad cop is held in reserve the same way that a police detective carries a hidden weapon. The ethical dualism means that Islam does not take part in the shared reciprocity of altruism. As an example, Islam is very big on charity, but Islamic charity only goes to Muslims. When Saudi Arabia sent money to New Orleans after hurricane Katrina, the money only went to Muslims, not to suffering kafirs. FP: Can you expand a bit on reciprocity of altruism? Warner: Reciprocity of altruism is the very basis of civilization. Islam does not share this trait. This is one of the reasons that Islam is not a part, nor can it be, of kafir civilization. Islam is built on different ethics and logic than the kafirs. Islam’s dualistic ethics prohibit reciprocity of altruism. Islamic civilization and kafir civilization do not share similar values. So a moderate non-violent Muslim thinks that you are a kafir and that a kafir does not have to be treated the same as another Muslim. The moderate Muslim (Islamic meaning) thinks that you are Allah’s scum and you can be treated like trash. Or not (dualism always has options). How can such a person be a true friend, if he believes the Koran. In some 14 verses, the Koran says that the Muslim is not the friend of a kafir. But what if the person actually is your friend? We can deal with this very important question if you wish. In any case, the term moderate Muslim has two totally different meanings. The kafir meaning is warm, fuzzy and incorrect. The Islamic meaning is cruel, precise and correct. FP: What are some other false kafir names? Warner: Radical Muslim. Extremist Muslim. Reformed Islam. What is a radical Muslim? A radical Muslim is capable of harming kafirs. A radical Muslim is a Medinan Muslim, but a Medinan Muslim follows Mohammed’s actions. So killing kafirs is not radical. Harming kafirs follows Mohammed’s example and is pure Islam, not a radical interpretation. FP: So, overall, what is the real issue here? These false names used by kafirs are an attempt to humanize Islam. The kafirized naming tries to put the violence (radical, extremist) outside of Islam or suggest that violence is a bizarre interpretation of Islamic doctrine. But Mohammed was involved in a violent episode on the average of every six weeks for his last nine years. Again, Mohammed defines moderation, and the violence is integral to Islam. The doctrine of both religious and political Islam is based on dualism and submission. The religious doctrine is of no concern to a kafir. It is the politics that concerns kafirs. Political Islam is based upon dualism and submission. All of humanity is divided into kafirs and Muslims, with not one good word for the kafirs. Names like “moderate” and “good” are an attempt to link goodness and Islam. But there is no goodness in Islam for the kafir, only for another Muslim. This is extremely harsh, but it is a consequence of the doctrine of political Islam. If you are well-read in the Islamic political doctrine, you may jump in and say that the Korans says a positive things about Christians and Jews. These few good things are a very few sentences. It is sad to see how Muslims and apologists drag the pitiful few sentences out of the Koran to show the good in Islam for the kafirs. First, compared to the massive amount of hateful, hurtful and evil things said about the kafirs, the few good sentences are statistically insignificant. But worst of all is that the good verses are contradicted by later doctrine. This is another aspect of dualism. The doctrine of Islam is not static since it is based upon the life of Mohammed. The doctrine describes a process. The conclusion of that process was annihilation of the native Arab culture with not a single enemy of Mohammed left standing. In the end, there is no good in Islam for the kafir, nothing. That is the conclusion to the process of political Islam. Those “nice, tolerant” verses are temporary tactics to be used while Islam is weak. Most kafirs treat the doctrine of Islam like a box of those magnetic words you can put on the refrigerator. By choosing the right words, they can make any sentence and any thought. But the doctrine of Islam is a very coherent story. It has a beginning, middle and an end. Islamic doctrine is taken from the life of Mohammed, not from a dictionary of unrelated facts. Indeed, the remarkable thing about Islamic doctrine is how systematic and logical it is. You can’t just reach in and take a sentence or verse here and there. What is the most important thing about a story is its conclusion. FP: And the conclusion is? Warner: The conclusion is that political Islam is always bad for the kafir. In the end, all Christians and Jews must submit to Islam. That is the goodness of Islam for kafirs. As long as the kafirs submit to Islam’s demands, then Islam is good to them. Dualism is the key to understanding Islam. On the surface many parts of the Koran contradict each other. The usual explanation is that the older, nicer verses are abrogated by the later verses. But in reality all of the Koran is true since it comes from the only god, Allah. Allah is perfection, and therefore, the contradictory statements in the Koran are all true. This violates Aristotelian kafir logic, but it defines the Islamic dualistic logic. In Islam two contradictory things can both be true at the same time. So for every one of those statistically insignificant “good” verses, each one is weak, and the stronger harsh and violent verses are stronger. Contradictions are integral to Islamic logic. To put a fine point on the previous claim—the only good for kafirs in the doctrine of political Islam is negated somewhere else. FP: So what is the good of Islam? Warner: Islam is the cause; Muslims are the effect. So if there is no good in Islam for a kafir, how is there any good in a Muslim for a kafir? There is not any good in a Muslim for kafirs. Cause and effect. But there can be good in people who call themselves Muslims. Now we get to our central problem. There are some nice people who are Muslims, how do we explain this? The doctrinal problem here is that a Muslim cannot be the friend of a kafir. The Koran says this 14 times. So if a friend is a Muslim, then that friendship has to be based on something other than Islam. Notice that Islam has a strong core doctrine of mutual Muslims friendship; indeed the Koran says that Muslims are brothers and sisters to each other. And why can Muslims be friends? Because they are equal. But a Muslim is not the political equal to a kafir because the Koran says that a Muslim is superior. So where does the good person who is a Muslim get his basis for friendship? The same place as everyone else does—from equality, the same equality that is inferred from the Golden Rule. Which others? All others, without exception. The Golden Rule implies the unity of humanity. There are no limits to its application. The Golden Rule does not apply to Islam. Indeed, Islam denies the truth of the Golden Rule. The duality of Islam divides all humanity into Muslims and kafirs. There are no two groups more unequal than kafirs and Muslims. FP: So what do we call the Muslim that is a friend of a non-believer? Warner: The goodness in your Muslim friend comes from the kafir civilization, not Islam. Your friend is a kafirized Muslim, but he is not a good or a moderate Muslim. Remember, Osama bin Laden is a good and moderate Muslim. FP: A kafirized Muslim. This is interesting. Expand for us please. Warner: A kafirized Muslim is a new naming, but an old reality. For some reason, every analysis of Muslims assumes that they are completely Muslim, without any kafir in them. But Islam does not drive all Muslims in all aspects of their life. Kafir culture has some very appealing ideals and people who call themselves Muslims are attracted to the benevolence in it. A true Muslim has absolutely no attraction to any aspect of kafir culture. The Koran and Sunna condemn 100% of kafir culture, so no Muslim has any desire to emulate kafirs. As soon as a person has any attraction to any aspect of kafir culture, they cease to be a Muslim and become kafir. That is the way the doctrine of Islam works. The name kafirized Muslim is analytic and fits the data. But kafirized Muslim is more than a name; it is a new concept with some very profound consequences. What are its advantages? It is better than any of the alternatives such as a “good Muslim”, a “moderate Muslim” or my “Muslim friend”. All of these names are an attempt to bring some good out of Islam. But, there is no good in Islam for kafirs, only for Muslims. The name kafirized Muslim acknowledges a bridge between Islam and kafirs. It is bigoted to assume that every Muslim has all of their behavior based upon Islam. Islam may demand that a person be 100% governed by Islam, but the truth is that Muslims are people and as people they are capable of picking and choosing. What is wrong with acknowledging that Muslims can be part kafir? What is wrong by acknowledging that the Golden Rule attracts Muslims? The word “Muslim” entraps a person into a small box. What we need to be able to do is recognize the person, not the Muslim. We live in a multicultural age where the majority culture is defined as oppressive. In order to distinguish yourself, you should be separated from the main body. Hence, a name like African-American exists. But these names come with a box. If you are African-American, you are supposed to have certain political and social views. Similarly, the name Muslim can become a narrow category for a person. A Muslim should only have certain views, or you are not a “real” Muslim. The name kafirized Muslim acknowledges that we are dealing with a person, not a category. The usual names, (good Muslim, moderate Muslim), attempt to credit the good found in Muslims to the doctrine of Islam. The term kafirized Muslim clearly states that the good comes from the kafirs, not Islam. Now we get to the crux of the politics of the made-up naming. These names represent a desperate attempt to deal with the problem of Islamic threats, violence and destruction of kafir civilization. Very few people know much about either the doctrine or history of political Islam. So they think of Islam as only a religion and believe since Islam has so many members, it must be one of the great religions. And all religions are good, so Islam must be good. But there is a nagging dark feeling about the violence in Islam. Since Islam has been defined good, there must be an explanation. Those Muslims who kill must be “extremist” Muslims. That leaves Islam as good with a few rotten apples. In Islam, Mohammed, Ali, Umar, Abu Bakr and all of the rest of the founding Muslims were “extremist” Muslims since they were killers over and over again. What kafirs call extremism is only Islam. FP: In the context of everything you are saying, what is the hope, or point, of trying to “reform” Islam? Warner: Some come up with the thinking that if Islam has nothing good for kafirs, then why not reform it? This idea comes from making an analogy to Christianity. However, Islam’s claims aside, there are almost no points of comparison between Islam and Christianity. On the issue of ethics, for instance, there is absolutely no analogy. The religion of Islam needs no reform. Who cares about how Muslims worship? All kafirs must be concerned with Islamic politics or how Islam defines them. The Koran, the Sira and the Hadith determine the treatment of kafirs. To reform the Koran, all of the hateful, cruel, and bigoted references to kafirs would have to be removed. If the kafir material is removed, then only 39% of the Koran remains. The greatest part of the part of the Koran, 61%, is devoted to negativity about kafirs. 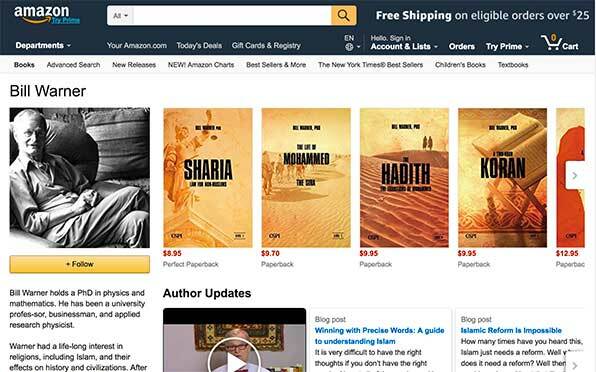 The Sira (the life of Mohammed) has about 75% of its material devoted to jihad. The Hadith has 20% of its material devoted to jihad. There is no one positive reference to kafirs. If you delete 61% of the Koran, 75% of the Sira and 20% of the Hadith, you will have reformed Islam. You will also have destroyed it. There is a very good reason that Islam has never been reformed. It is impossible. Is it so hard to believe that a political system with the name “submission” (that is what Islam means) is violent and can’t be reformed? To submit is a demand of force. Why would Islam want to reform? It works. You don’t fix a system that works. The other objection to Islamic reform is that there is no central hierarchy that makes decision for Muslims. Anyone can read the doctrine and decide what to do. No one has the authority to decide what every Muslim can do. In that way, Islam is like the Internet; it is a distributed system with no central doctrinal authority. Who speaks for Islam? Mohammed. Who interprets Mohammed? Any Muslim. You can have a kafirized Muslim, but there is no such thing as kafirized Islam. Islam cannot be reformed. Hence, the name reformed Islam is only a kafir dream. FP: So we need to start using the right names and terms. Warner: Of course. The right names help to think right thoughts. Muddled names lead to muddled thoughts. If we are serious, we must start using the right names to describe Islam. Our terms must be based upon Islam, not kafir dreams. If we want to refer to the more peaceful Muslims, call them Meccan Muslims. The jihadists are Medinan Muslims. Wrong names include: moderate Muslim, extremist Muslim, good Muslim, radical Muslim. Right names include: Meccan Muslim, Medinan Muslim, kafirized Muslim. We must take control of the language. Incorrect names lead to incorrect thinking. We have to use the right names to defeat political Islam. FP: So what point of view is your argument and outlook based on? Warner: All of this analysis is based upon a kafir-centric view. There are three ways to examine Islam—believer, kafir and dhimmi. The believer-centric view is the standard Islamic viewpoint. For the believer, the Koran is the perfect word of the only god of the universe and Mohammed is the prefect pattern for all human life and all times. Kafir-centric analysis looks at Islam from the viewpoint of the kafir; how does this affect us? Kafir-centric analysis is the view of the victim. As an example, in the Sira, Mohammed’s triumph over the Meccan polytheists is told as a wonderful victory. From the view of the kafir, it represents the annihilation of a tolerant society and the creation of the modern apartheid state of Arabia. As a result of Islam, the Arabs went from being a tolerant people to being the most bigoted and biased society on earth. The kafir-centric school is skeptical and analytic. The dhimmi-centric viewpoint is the academic school and is neither fish nor fowl. It is marked by political correctness and never refers to the deaths of the 270 million kafirs, never talks about the suffering of the dhimmis. The dhimmi-centric school is actually believer-centric lite. It rarely applies skepticism. The dhimmi-centric school is the predominate school in the universities, military, law enforcement, government and the media. The dhimmi-centric school is very fond of using modern political science to analyze Islam. One of the marks of the dhimmi-centric school is to ignore Islamic political theory. For instance, jihad is never used to explain violence. Or Israel is seen only as a modern political state and the Palestinians are just another political group. Reading the Israelis news stories, you would never know that Islam had a doctrine of war. But when you read the communications of the Palestinian leaders, it is crystal clear that it is jihad against the kafirs in Israel. From the standpoint of Islam, if every Jew in Israel were a Hindu, nothing would change. Multiculturalism is all the rage these days. What is strange is that only the believer-centric school and the kafir-centric theory explain Islam by its doctrine. The dhimmi-centric academic school avoids this at all costs. This is ironic since it was the academics who created multiculturalism. So the dhimmi-centric school is bigoted and euro-centric by its own standards of multiculturalism. FP: Bill Warner, thank you for this fascinating and eye-opening discussion. Warner: You are welcome Jamie. Before the Dawn: Recovering the Lost History of Our Ancestors, Chapter 8, Sociality, pgs. 130-180, Nicholas Wade, Penguin Press, NY, 2006. All scholars agree that there is the early Koran written in Mecca and a later Koran written in Medina. These two Korans are so different that they can be given the names Meccan Koran and Medinan Koran. Stop posting garbage. there are not 2 versions of Quran, Please back it up with facts. There are various sects of Islam (Shia, Sunni, Wahhabi, Sufi etc. ), but there is only 1 version of Quran. there arenot tow koran .koran is asingle book of allah and messages and words ofallah.there is no need to distiction to meeca koran and madina koran it is the book like torah and injeeland bible which is reveald on hazarat mohammad(saw}last book of allah islam is a religion of peace .some chapters revealed in macca and some in madiana.